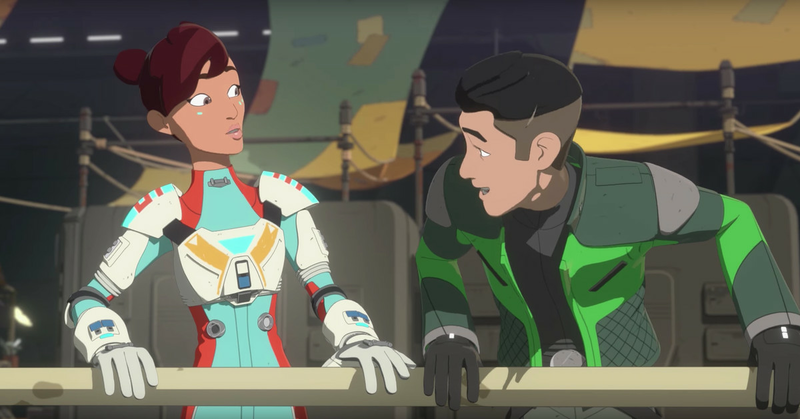 Disney has released a second featurette introducing some of the characters in its upcoming animated show, Star Wars Resistance: the Aces, a team of pilots who protect the base. The show will follow the inhabitants of Colossus, a massive floating base located on an ocean planet. Back in August, we got a featurette that introduced Team Fireball, a group of racing pilots, including Kaz, (voiced by Christopher Sean), who’s recruited into the Resistance as a spy. This new featurette shows off another group of pilots and a bit more of the high-stakes racing that will take place in the show. First up, there’s Torra Doza (Myrna Velasco), a young, bubbly and gifted pilot, who’s friends with Kaz. There’s also the cocky Hype Fazon (Donald Faison), cranky and ex-Imperial pilot Griff Halloran (Stephen Stanton), the cold Frey Fenris (Mary Elizabeth McGlynn), and the daring Bo Keevil (whose voice actor wasn’t revealed, weirdly). Star Wars Resistance premieres on Sunday, October 7th on Disney Channel.